BEND, OR, September 24, 2018 — Ventana Research today announced the recipients of the 2018 Digital Leadership Awards. These awards, presented annually, spotlight organizations and those individuals with supporting technology vendors that utilize technology to advance business and IT. The Ventana Research Digital Leadership Awards is a prestigious leadership awards program, backed by a proven industry analyst firm with market research and expertise across business and IT. The awards recognize individuals and companies that have utilized and championed improvements across their people, processes, information, and technology to grow their business and industry potential. 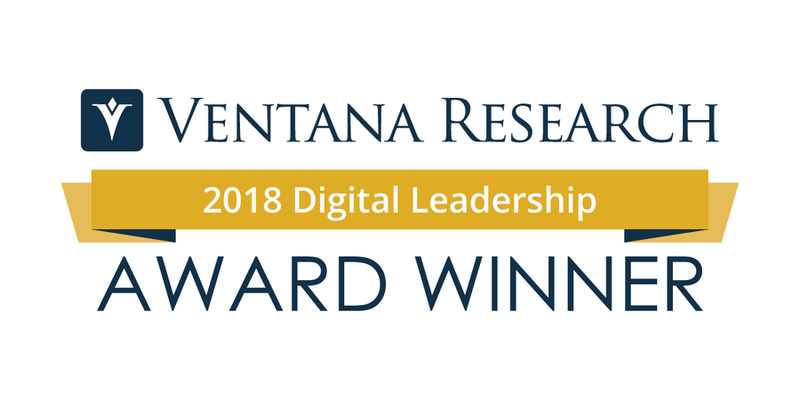 These Digital Leadership Awards span across the nine areas of expertise at Ventana Research, with one overall Digital Leadership Award winner. The 2018 Overall Digital Leadership Award Winner – This award is the most prestigious award offered. It is given to the individual and company who best exemplifies Overall Leadership. Analytics – This award is for the individual and company that best exemplifies leadership in any use or application of analytics across business and/or IT. Big Data – This award is for the individual and company that best exemplifies leadership in big data and related technologies for supporting data and information management related needs. Customer Excellence – This award is for the individual and company that best exemplifies leadership in applications and technologies that support the engagement with customers for any purpose. Digital Technology – This award for the individual and company that best exemplifies leadership in the technologies that support any or all of the following areas: Big Data, Business Analytics, Business Collaboration, Cloud Computing, Internet of Things, Machine Learning, Mobile Technology, Social Media or Wearable Computing. Human Capital Management – This award is for the individual and company that best exemplifies leadership in the applications and technologies that support human capital management. Marketing – This award is for the individual and company that best exemplifies leadership in the applications and technologies that support marketing. Office of Finance – This award is for the individual and company that best exemplifies leadership in the applications and technologies that support the office of finance. Operations & Supply Chain– This award is for the individual and company that best exemplifies leadership in the technologies that support the operations of a business. Sales – This award is for the individual and company that best exemplifies leadership in the application or technologies that support the sales organization.